A second dig to find out more about the private Roman bath house hidden beneath Chichester's Priory Park has yielded yet more fascinating discoveries. Residents are thanked for increasing recycling rate to 45%! The most significant find has been part of a large hot bath which would have been large enough to contain up to four people. A section uncovered last year was originally thought to be part of the roof which had collapsed into the heating system. But the team's work over the past two weeks instead revealed it to be a luxurious tub made from mortar, tiles and bricks. The bath's size helps confirm the theory that the site was inhabited by someone of great wealth and importance. 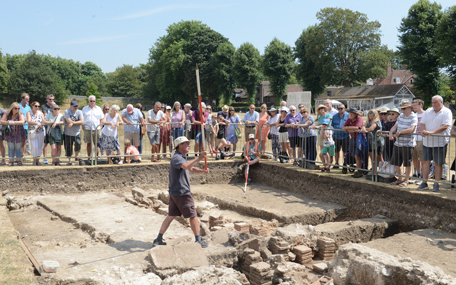 "This was a private bath house, and just to keep it going would have required huge wealth and resources," explains James Kenny, archaeologist for Chichester District Council, who has been leading the dig with dedicated volunteers from the Chichester and District Archaeology Society. "It would have been filled with really hot water, and for the owner to be able to use the bath house throughout the year it would have required staggering amounts of charcoal for the furnace, and a considerable amount of tending and stoking to keep it going. "This conspicuous consumption would have highlighted that the person or people who lived here were affluent and of high status. The bath house would also have had mains water, and this would only have been accessible to the wealthiest people in the city." This year's dig has involved excavating the east end of the bath house, with the last room taking up half of the building. The team also uncovered the foundation of an arch which would have supported a dividing wall, separating the bath house into hot and warm rooms. The team have also found more of the heating system, known as the hypocaust. The bath house would have contained columns of bricks which would have been supported by very large (two feet square) bricks, which in turn would have supported a mortar floor. The team didn't find any whole examples of these large bricks, just a few broken ones. Other evidence found on site means that during the Middle Ages the site was ransacked specifically for these bricks. They would have been used to make hearth stones, bread ovens or corn drying ovens - anything that required a lot of heat. Other Roman finds include tiles, some of which would have helped form the arches, and numerous pottery fragments. This is the second public dig to take place on the site, the first was held in May 2017. The idea is to give members of the public the opportunity to watch archaeology in action, and discover more about this fascinating period in Chichester's history which has survived untouched for more than 1,600 years. A series of talks will take place at the site on Saturday 22 July so people can hear about this year's finds. The bathhouse is of great national importance because it so unusual to find the remains of Roman buildings that have survived in such a good condition in a built up area. "We are extremely pleased with how this year's dig has progressed and that so many people, including school parties, have come along to find out more about this unique piece of history," says Susan Taylor, Cabinet Member for Planning at Chichester District Council. "It's so important for people to have the opportunity to learn more about the history of their city and the volunteers working with James, have worked so hard over the last two weeks to help find more which will give us an even better understanding of what life was like back in the time of Roman Chichester." A future dig has not been confirmed, but if another was to take place it would focus on making a connection between this bath suite and the house that it served. All the finds from this dig will be recorded and catalogued, and the site refilled and returned to parkland. People can also find out even more by visiting The Novium Museum in Tower Street, Chichester, contains the remains of a Roman bathhouse as well as a permanent Roman exhibition.